Note : This is for season one and two. Synopsis has been edited in order to account for that. The story revolves around Yuuta, a boy who wants to hide his chuunibyou past and Rikka, a girl who is desperately trying to recover that past. The two decide to start a club, whose name ultimately becomes "The Far Eastern Magic Nap Society of Summer". The comedic moments of embarrassment and of argument within the club lighten the mood of this romantic slice-of-life. In the second season, the focus is more on the romantic relationship between Rikka and Yuuta. However, when a new girl from Yuuta's past walks in, Rikka experience what jealousy is for the first time. Before the relationship can fall apart, Rikka's friends gain-up on Yuuta, in an attempt to hurry things up. Hilarious moments follow and the story from there takes an emotional path, developing and investigating what a relationship truly is. Although the anime is produced by KyoAni, it does not carry the same quality of art as their previous works. That is not to say that it is good quality, but I was expecting more from KyoAni. The chuunibyou battle scenes were amazingly animated. The luminous and contrasting colours really help make the difference between reality and the alternate universe. The opening and ending songs are okay, though they are not anything unique, except for the first ending song, "INSIDE IDENTITY". The background music was quiet and melodic, fitting in nicely with its respective scene. The voice actors were appropriate matches for their characters. Fukuyama Jun did an excellent job as always. Uchida Maaya also did a terrific job voicing Rikka, successfully saying "Schwarz Sechs Prototype Mark II" in her cute Engrish voice. Their chuunibyou-ion selves are a delight to watch and their interactions with each other are also quite amusing: Yuuta (playfully) hitting Rikka whenever she says something stupid, and Dekomori taunting Nibutani into admitting that she is indeed a fake Mori Summer. Rikka's character undergoes the most development of all the characters: her family life, her chuunibyou self, and her romantic life. For her, she has no idea what being in a relationship means, so she checks the Internet for advice. Hilarity ensues but you see a confused human side to her as she tries to comprehend what being in love is. A frustrated Rikka after she searched what love is on the internet. Okay, so maybe Chuunibyou is not the greatest of anime. However, there was always something in the show that pulled me to watching the next episode. 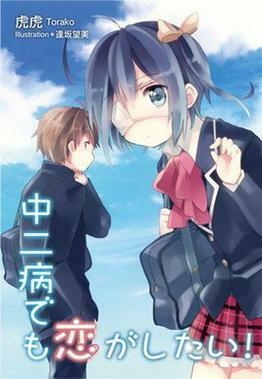 In the first season, it was the comedic elements and the hope of Rikka and Yuuta actually acknowledging their feelings. In the second season, it was simply to watch Rikka. Her understanding of love is restricted by her chuunibyou but the confused ideas she has are powerful and struck a cord in me. Yuuta does not pressure her and instead, decides to go against his friend's advice and take things slowly. Let me say, that that decision made the ending a whole lot sweeter. Chuunibyou Demo Koi Ga Shitai is a entertaining romcom anime by KyoAni. It will make you smile, laugh and may make you tear up at times. One can experience first-hand the blossoming of a powerful relationship between two excellent characters. I recommend this anime to anyone who has watched Kimi Ni Todoke and The Melancholy of Haruhi Suzumiya.